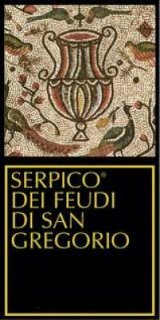 2004 Feudi San Gregorio Serpico - $54.99: Vins Rare, The finest selection of rare wines. ($85) The 2004 Serpico is an excellent choice for readers who want to enjoy an Aglianico with quite a bit of tertiary character. Wild cherries, game, earthiness, tobacco and licorice flow from this burly, somewhat rustic Serpico. The French oak has added a measure of richness, but is now nicely integrated. Menthol, dried flowers and leather add the final layers of complexity on the building finish. This is a firm, hearty Serpico that needs to be opened at least several hours in advance. Relative to Campaniaâ€™s other heavy hitters, Serpico lacks a measure of elegance and finesse that many other wines were able to achieve in this vintage. Anticipated maturity: 2010-2020. 91 points. The famed Veronelli Guide, Italy's leading guide to wine, has given the 2004 Serpico (100% Aglianico) the vaunted "I Super Tre Stelle" (the Super Three Star) rating and 96 points.